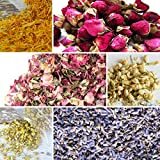 This Valentine's Day or anytime you're feeling a bit more romantic, sprinkle these cool new Edible Rose Petals over ice cream, cupcakes, teas, salads, soups, water, or maybe even yourself. These fragrant organic rose petals are completely edible garnishes, come in a standard glass jar to store with the rest of your spices, and are made in Minnesota, USA. Obviously, do not give a jar of these dried rosebuds to your sweetheart in lieu of a bouquet of fresh roses on Valentine's Day.